The disabling disfigurement suffered by many burns victims could be consigned to history thanks to a revolutionary new dressing developed by a team of Birmingham scientists. Researchers at the NIHR Surgical Reconstruction and Microbiology Research Centre (SRMRC) and the University of Birmingham have created a biomembrane using the molecule Decorin which they hope will prevent scarring in injured tissue. The dressing will now be tested on burns patients at Queen Elizabeth Hospital Birmingham (QEHB), where the NIHR SRMRC is based, in a three-year clinical trial after the team were awarded a £1.6 million grant from the Wellcome Trust to fund further research. Decorin is a synthetic version of a molecule which occurs naturally in the body – albeit in tiny amounts – most notably in the amniotic membrane. Professor Ann Logan, who specialises in molecular neuroscience, identified it as a possible agent in anti-scarring dressings through her work looking at how to repair injured brain and spinal cord tissue. 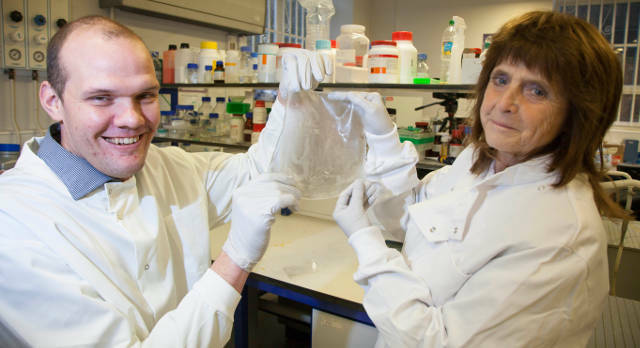 Professor Liam Grover, a biomaterials expert, then created a membrane wound dressing which incorporates the synthetic molecule and can be produced in sheets big enough to cover large areas of the body. The dressing can be freeze dried, allowing it to be stored and manipulated by surgeons without damage, before being rehydrated with saline ahead of use. This novel property means that it could even be used by soldiers on the battlefield, keeping a dressing in their kit with a sachet of saline for use in an emergency. Researchers will now work with burns consultant Mr Naiem Moiemen at QEHB to trial the dressing on patients, through the Healing Foundation Centre for Burns Research, a partnership involving the hospital and university. If successful it will be developed to be used in other tissues where scars can be problematic, such as in the eye or after neurosurgery. Currently, the main priority for doctors treating burns is to prevent dehydration and infection, rather than scarring – but scars, and the contractures they create, are unsightly and can permanently hamper movement. Decorin prevents the development of contractures, allowing the wound to be closed with normal tissue rather than scar tissue. Prof Logan said: “When the tissues are damaged, it is a race between scarring that quickly closes the wound with a ‘patch’ and regenerative healing that reconstructs more normal tissue – therefore our strategy is to use Decorin to slow down the scarring process. “We don’t necessarily want to stop scarring per se, but promote the speed of regenerative healing before the skin scars. It’s about giving skin the time to heal naturally before the scarring takes over. Prof Grover added: “This clinical problem, of slowing down the scarring to allow the skin to heal, was brought to me to see if I could create a robust burns dressing that could deliver drugs like Decorin without falling apart in the challenging wound environment. “The trick is to ensure the drugs don’t affect the properties of the dressing and the properties of the dressing don’t affect the activity of the drugs. Life Sciences Minister George Freeman MP said: “Burns can be devastating injuries often with huge impact on victim’s lives, so it is great to see such a revolutionary treatment developed right here in the UK.